THE JOURNEY BEGINS WITH VERSA-MAX™ TRAILERS. Whether you’re looking for a tilt or ramp trailer, the Versa-Max™ is the perfect solution. These trailers allow you to quickly load up your stuff and get to where you want to be – hassle-free! Backed by FLOE’s 10 year limited warranty. VERSA-TRACK™: Many manufacturers have tried to imitate FLOE’s Versa-Track™ system and their products are merely imitations. Versa-Track™ is simply the easiest to use tie-down system available today. A few of the benefits you’ll receive from this unique system are true infinite tie-down options - you can attach the Versa-Track™ tie-down accessories anywhere along the track. Quickly and easily balance loads for optimum towing. Quickly tie down equipment. Use of all Versa-Track™ accessories for maximum versatility. Added structural integrity as the Versa-Track™ is a part of the trailer structure. Integral part of the deck as it provides a channel system for the plywood decking to slide into - the Versa-Track™ firmly secures decking and protects the edge of the wood from the elements. VERSA-LOCK™: Insert the Versa-Lock™ in the Versa-Track™ and push the lever down. Stays on your tie-down bar so it won’t get lost in the snow. Can be locked with a padlock. VORTEX HUB: All FLOE Versa Max and All Terrain pro trailers come standard with Vortex Hubs. These hubs have the best features of grease and oil lubrication providing long term continuous bearing lubrication and ease of service or inspection. Other Vortex features include stainless steel wear sleeve. Vortex internal through-the-spindle lubrication system. Super strong reusable threaded easy on/off removable grease cap – no tools needed. Premium grade Lucas Oil Marine grease. 100,000 mile or 6 year limited warranty. No maintenance/service for lower operating costs. No need for periodic re-greasing or inspection. 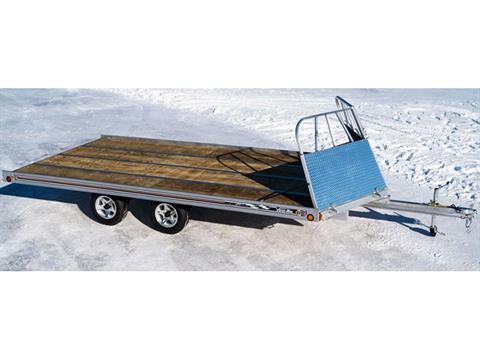 REAR BUMPER: FLOE's patented rear bumper is an all-in-one solution for protecting the plywood decking from edge damage common to any wood decked trailer without protection. Allows your decking to last longer and look better without splints and nicks. Minimizes damage from loading and unloading. The removable rear bumper slides into place after the decking is mounted to the trailer. Caps off the back edge of the plywood for a cleaner look. ENCLOSED WIRING WITH LED LIGHTS: All Versa-Max™ trailers are equipped with LED lights. This commercial grade lighting package is grounded directly through the molded wiring harness to the tow vehicle. They are completely protected and concealed within the trailer frame providing years of trouble free lighting. LED bulbs are brighter, create less heat and last longer. The lexan front clearance lights are stronger and can take a beating on the road. Plug holder on tongue keeps plug dry and corrosion free when not in use.